To learn more about the Society's holdings, search our online catalog  for subject terms like "art", "music", "literature", or "culture". You should also search for specific artist names, performance venues, or other keywords that may provide insights into your research interests. Descriptions of all manuscript collections are available in that online catalog, and many collections have finding aids online or at HSP that provide more information. Visitors to HSP's library should also look for terms of interest in our graphics card catalog , known as PC4 (and not available online), or our music catalog , known as PC5 (and not available online). Researchers may also want to look for names and other terms of interest in our manuscripts card catalog , known as PC1 (and not available online), which serves as a name index for many manuscript items. Collections from the Balch Institute for Ethnic Studies, which merged with HSP in 2002, are also described in this online manuscript guide . Researchers can also find thousands of items related to arts and culture in HSP’s Digital Library , a growing online repository of images and digital files from our collections. To date, the Digital Library includes more than 75,000 images of manuscripts, maps, photographs, and prints, as well as video and audio records. Several of HSP’s most notable collections, including the David J. Kennedy watercolors , are digitized in their entirety. All images are available for purchase as both archival prints and digital downloads, and new content is added every week. For assistance using any of these research tools, please contact our Ready Reference staff by email , call our Reference Line at (215) 732-6200 ext. 209, or just drop by the Reference Desk. In addition to searching in our online catalog  and HSP's Digital Library  for prints, drawings, watercolors, and other graphics, researchers may want to consult HSP's PC4 graphics card catalog, which is available only in the library's Reference Room. Information in PC4 and other card catalogs may not be captured by online-only searches. The Society has extensive holdings of works of art on paper, including Benjamin West drawings  (collection 3149), David J. Kennedy watercolor views of Philadelphia  (collection V61), William L. Breton (various call numbers), Violet Oakley prints and sketchbooks  (various call numbers, collection 3386), D. Sargent Bell photographs  (collection V01), and lithographic portraits of Native Americans by J. O. Lewis  (call number Bd 69 L 587) and Thomas Lorraine McKenney  (call number Bd 69 Mc 196). HSP's collection also contains the works of Philadelphia artists and engravers Thomas Birch, Max Rosenthal and Peter S. Duval, as well as copier and portraitist Albert Newsam  (collection V100). The HSP print collection  (collection V89) and HSP portrait collection  (collection V88) provide a rich visual catalog of various local, regional, national and international people, locales, institutions, and scenes. A large portion of HSP's graphic works on paper are photographs. The HSP photograph collection  (collection V59) is rich with images of Philadelphia and the surrounding region, documenting everything from local streets and residences to major events like Lincoln's funeral and the Centennial International Exposition. Other large photographic collections include the HSP Penrose Pictorial Philadelphia collection  (collection V60), the Philadelphia Record Photograph Morgue  (collection V07), and the Thomas H. Shoemaker Germantown and Philadelphia Portraits and Views  (collection V86). HSP's collections include the personal papers of a number of people in the arts, such as engraver John Sartain (in the Sartain family papers , collection 1650), painter John Neagle  (collection 2112), and miniaturist Anna Margaretta Archambault  (collection 0011). Several collections document members of the Peale family , especially painter and museum curator Charles Willson Peale and arts writer Rembrandt Peale. The papers of Lebanese singer, dancer, actress and storyteller Wadeeha Atiyeh  (collection MSS009) contains programs, reviews, publicity and public relations announcements, scripts and music from her productions, writings, correspondence, and published works. Other notable collections include the papers of actress Rose Quong  (collections MSS132 and PG352), musician Andrew Salama  (collections MSS 122 and PG309), and musician, writer and inventor Mary Elizabeth Hallock Greenewalt  (collection 0867). Researchers may also be interested in organizations that support and celebrate the work of artists, such as the Fairmount Park Art Association  (collection 2045), the Print Club  of Philadelphia (collection 2065), and the Plastic Club  (collection 3106), which is the oldest club for women artists still in existence. HSP's holdings include a variety of sheet music and music books, including operas, librettos, psalms and hymns, popular and patriotic songs, jazz, and more. Researchers may want to consult our music catalog , known as PC5 (and not available online), for more information on individual items. The HSP Music collection (collection 0948)  contains a large number of arrangements from the nineteenth century, as well programs from the Metropolitan Opera House of Philadelphia, 1908-1927 and the Robin Hood Dell, 1930-1940, among other items. The Balch Institute Sheet Music collection  (collection 3141) contains sheet music representing or created by members of a variety of ethnic groups, much of it reflecting stereotypes. The most prevalent materials are related to the following ethnic groups: African-American (spirituals, minstrel songs, folk songs), Jewish, Greek, Italian, Irish, and Scandinavian. Other collections of interest include the Handy Brothers Music Company jazz composition collection  (collection MSS026), the Thadeus Navickas music papers  (call number D0275), Johannes Kelpius collection of German hymns  (call number Am .088), and Frank Dumont minstrelsy scrapbook  (collection 3054). Researchers might also be interested in the records of cultural organizations and performing groups, including the University Glee Club of Philadelphia  (collection 0948) and United Singers of Philadelphia  (collection 3524). The large HSP collection of Academy of Music programs, playbills and scrapbooks  (collection 3150) spans from the organization's founding in 1857 to 1972. HSP's staff assembled the collection gradually from materials that were received from multiple sources over time, and includes materials from the Philadelphia Orchestra, New York Metropolitan Opera Company, Princeton's Triangle Club, Philadelphia Grand Opera Company, Pennsylvania Ballet,and Boston Symphony Orchestra, as well as local schools and groups that held their receptions, balls, commencements, benefits, and reunions at the academy. The records of the Theatre of the Living Arts , or TLA, (collection 3378) includes administrative records of this Philadelphia theater from 1965-1970, mailing list information, playbills and programs, scripts, royalty records, and invoices. The HSP playbill collection  (collection 3131) includes playbills and programs from various theatres in Philadelphia and other cities from 1754 to 1989. 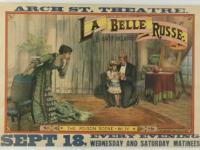 The HSP theater poster collection  (collection V06) contains over 1300 theatrical posters and announcements for performances of minstrel shows, wild west shows, operas, burlesques, musical reviews, comedies, circuses, and plays. Much of the material dates to the nineteenth century. HSP's collection of literary works encompasses a broad range of genres, time periods, and languages. Of particular note is a substantial collection of Yiddish literature . Manuscript literature includes poetry by a number of women in the early republic, such as Deborah Borton  (call number Am .03375), Elizabeth Graeme Fergusson  (call number Am .067), Susan H. Gardiner  (call number Am .06883), and Mary B. Garrigues Lodge  (call number Am .06885). Researchers also may be interested in the records of various nineteenth century literary associations, including the Platonian Literary Association  (call number Am .3175), Pennsylvania Literary Association  (call number Am .3117), and Pennsylvania Literary Society  (call number Am .317). Collections related to printing and publishing include the Bradford family papers  (collection 1676), George Horace Lorimer papers  (collection 1679) and the records of Lea and Febiger  (collection 0227B) and Curtis Publishing Company  (collection 3115). Cultural organizations are represented through a range of published materials, as well as the records of such organizations as the American Institute for Italian Culture , National Carl Schurz Association , and Philadelphia Ceili Group . The Amandus Johnson papers  document Johnson’s work with a large number of Swedish-American cultural organizations. The Folklife Center of the International House  (collection 3716) hosted workshops and programs on folklore and traditional music from around the world. The Society of Arts and Letters of Philadelphia  (collection 1659) encouraged original work in music, literature, and allied arts, while the Museum Council of Philadelphia and the Delaware Valley  (collection 2083) promotes cooperation among the city's cultural institutions.